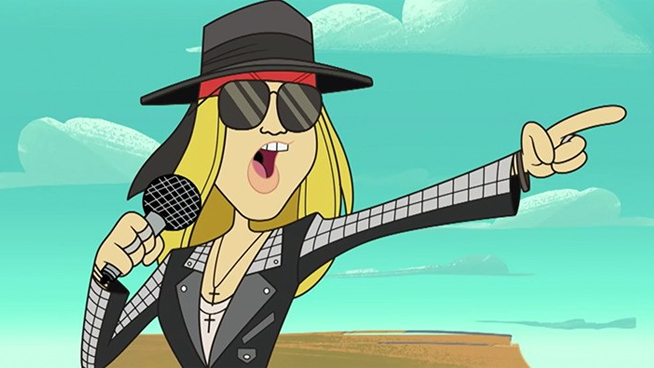 Guns N’ Roses frontman Axl Rose can check off another accomplishment from his career, “Looney Tunes character.” Fans can watch Axl Rose, appearing as himself, in an upcoming episode of the Boomerang animated series “New Looney Tunes.” As you can see in the clip below, Axl Rose, along with Bugs Bunny and company perform a song called “Rock The Rock” in order to prevent an anthropomorphic asteroid from hitting the earth. Axl Rose singing “Rock The Rock” marks the first new recorded song from him since the release of Guns N’ Roses’ Chinese Democracy back in 2008. Watch the scene below. Follow Guns N’ Roses here.